This feature consists of 30 small boulders forming a circle about 12m in diameter. The largest stone only reaches 0.40m above ground level and there is also a stone set in the centre. The large piles of stones on each side are this settings are the result of field clearance. 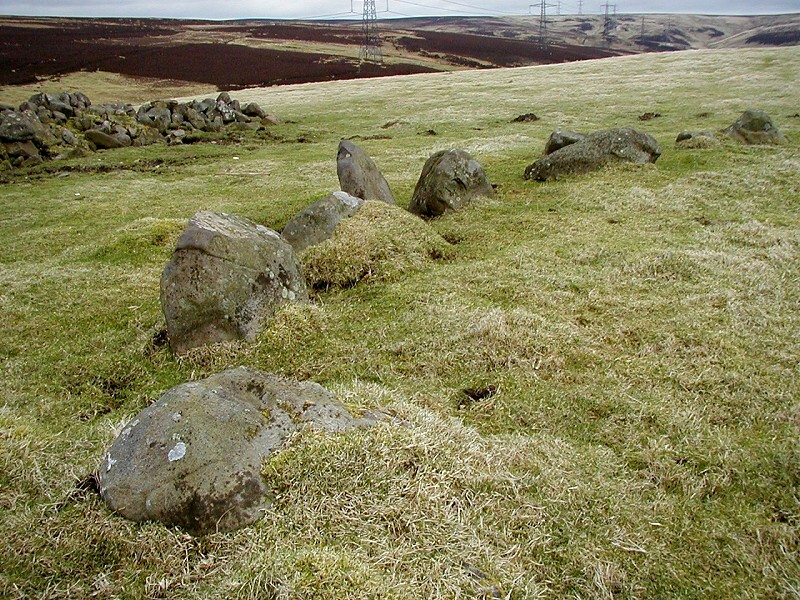 This ring of stones has been noted as a stone circle but has also been described as a probable enclosed cremation cemetery - a hybrid ring cairn/stone circle. Taking the B6355 east from Gifford stop near the electricity pylons at the entrance to Mayshiel Farm. Follow the fence line down to Kingside Burn then head east, keeping to the fence. The enclosure is in the field to your right, located between two large piles of stones. On off-road grass area near entrance to Mayshiel Farm. Just next to electricity pylons. This can be a tricky site to find. Kingside Hill is dotted with modern clearance cairns and ancient burial cairns and finding the right one requires some careful map reading. I used this example to try out my GPS receiver by entering the 8-figure grid reference and following the direction arrow. It's difficult to make out what this location actually is. It does not quite come into the stone circle category and is bigger than the other cairns in the vicinity. One suggestion is a cremation cemetery but I suggest you go and decide for yourself. There are plenty of other stones in the area to check out as well.